Nothing is ever as it seems with Walter Van Beirendonck. 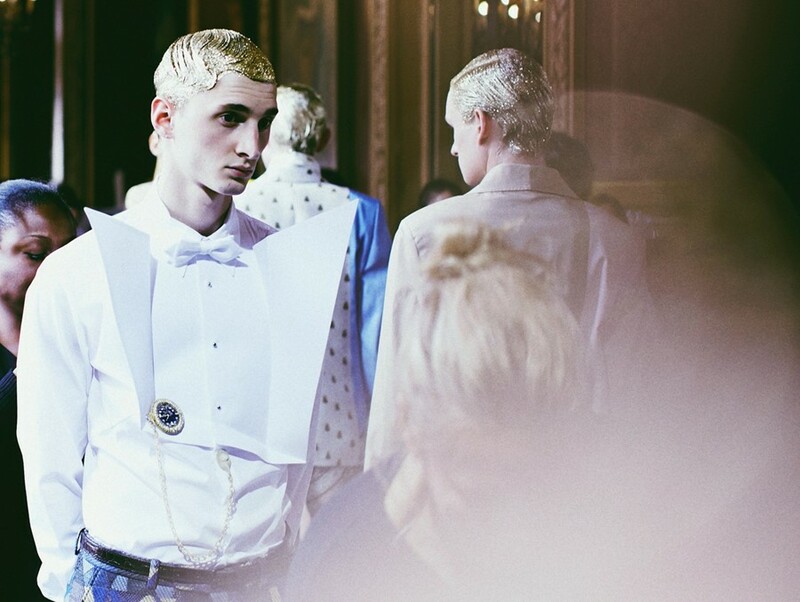 Fashion’s own enfant terrible has been distorting menswear since the early eighties and yesterday’s show at The Place de l'Opéra was no different. Classic suits were covered with garish prints, geometric patterns and 2-D cut-outs, which sprung out from the body like some sort of children’s pop up book. It was a show of surrealism - Van Beirendonck distorting his own ideas concerning dreams and reality. This season, a newfound elegance infused the collection. Most notably with his impeccably tailored suits and elongated silhouettes, but also with the models slicked back hair, which was covered in gold glitter. Van Beirendonck also collaborated with milliner Stephen Jones on a series of oversized woven baseball hats, which became another ode to surrealism. However, his greatest feat – another reminder of his status as an agent provocateur – came with his shoes, a series of metallic snakeskin designs covered with the outlines of male genitalia.